A distant planet outside of our solar system is not only being eaten alive, but it also reflects almost no light. 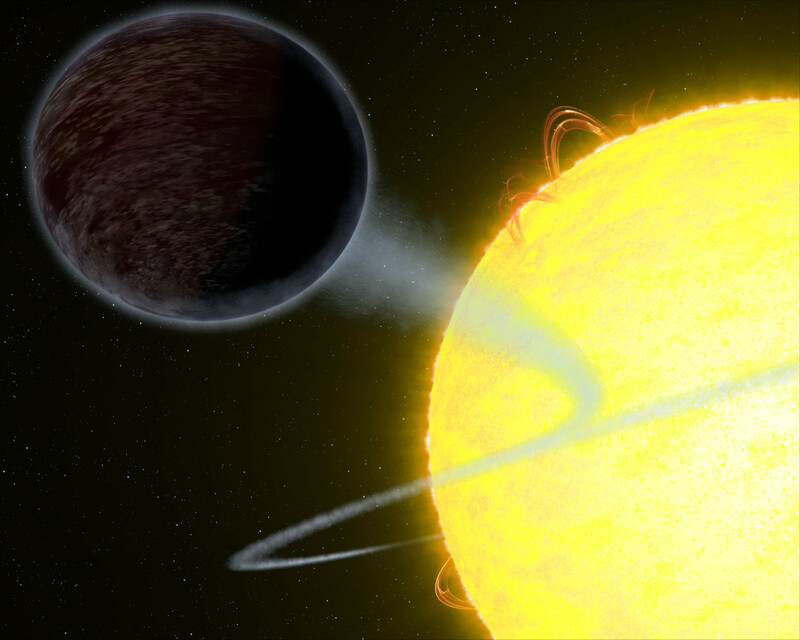 New observations from the Hubble Space Telescope have revealed that the well-studied exoplanet WASP-12b — which is located about 1,400 light-years away from Earth — has an albedo, or reflectiveness, that is “darker than fresh asphalt,” according to principal investigator Taylor Bell, an astronomy master’s student at McGill University in Canada. WASP-12b was discovered in 2008 and remains a subject of intrigue for astronomers. The planet, called a “hot Jupiter” because it is huge and very close to its star, has an egg shape due to the star’s gravity. The star also tugs on the planet’s atmosphere, stripping away the gas giant’s outer layers. Astronomers made the new observations to learn more about the composition of the atmosphere. Specifically, the team found that WASP-12b is made up mostly of helium and atomic hydrogen. On the day side of WASP-12b, it’s too hot to form clouds and alkali metals become ionized, meaning they gain or lose electrons. The heat also breaks apart hydrogen molecules into atomic hydrogen, a common element in low-mass stars. It’s the hydrogen, in combination with WASP-12b’s temperature, that makes the albedo of the exoplanet so low. WASP-12b’s albedo is only 0.064. By comparison, Earth’s albedo is about 0.37 and Enceladus – an icy Saturn moon that has the highest reflectivity of the solar system – has an albedo of 1.4. The researchers measured WASP-12b’s albedo during an eclipse, when the planet went behind its host star. Scientists looked at the amount of light being reflected using Hubble’s Space Telescope Imaging Spectrograph and compared their observations of the planet to previous atmospheric models. What they saw didn’t match either of the proposed models. While WASP-12b doesn’t reflect any light, the planet is so hot that it glows with a red sheen similar to glowing metal. It is only the second planet to have albedo measurements using a spectrometer; the first was another hot Jupiter called HD 189733b.